Connectors have a way of thinking and acting that enables stronger relationships. I curated my connections and include expert advice from over two dozen authors, coaches, and business owners including Marshall Goldsmith, Dorie Clark, Ivan Misner, Susan RoAnn and more. Regardless of your goal; a job, a promotion, new business, a referral… who you know and who knows you will lead to opportunities. It is the strength of your relationships that leads to your success. Michelle has written several books that truly help people work better together. From getting the job you want in Nail the Interview, Land the Job and Heroes Get Hired to continuing to build your network in The 11 Laws of Likability and The Connector’s Advantage. Michelle provides the resources to further your success. Featuring real-life anecdotes, activities and self-assessments, her books are easily actionable and perfect for anyone at any level of an organization. If you want to be a leader of the future, you must know how to build alliances and partnerships – The Connectors Advantage will help you do just that. Marshall Goldsmith, the New York Times #1 bestselling author of Triggers and What Got You Here Won’t Get You There. In the new economy, it’s not who knows you, it’s who trusts you. When in doubt, don’t forget Michelle’s Law #10. Too often I meet talented and highly skilled women who wait too long before enlisting allies who can help them grow in their careers . The Connector’s Advantage is the book these women have been waiting for—a guide that clearly shows how to cultivate and grow the strong circle of connections that is key to sustainable success. As a CEO and a leadership coach, I’m often called on to share my insights with others. My advice is always the same: create positive lasting memories with authentic, human connections within your organization and beyond. Not only does Michelle Tillis Lederman understand how to do this, but she communicates this knowledge with ease. The Connector’s Advantage is the authoritative guidebook to navigating and maximizing the potential of your connections. I know how many hurdles there can be to growing a business—a strong network gives you a leg up. The Connectors Advantage offers real, applicable advice on how to create authentic connections for reaching your potential, and standing out from the crowd. Dorie Clark, adjunct professor at Duke University’s Fuqua School of Business and author of Stand Out Networking. The Connector’s Advantage is a treasure trove of information about how to build strong, valuable ties that enhance your personal and professional life written by someone who has done the research and put it into practice. There is no doubt that being a Connector is a huge business advantage and great step towards success. Read this book for a roadmap. 2 huge Likeable thumbs up from me! Michelle Tillis Lederman has the ability to drill down on human experiences and find the essential lessons to be learned from them. There are times I just want to hunker down with my laptop, but I add the most value when I’m out kissing frogs. If you’ve ever wondered why some people seem to be better at building stronger, more effective relationships than others, The Connector’s Advantage is a must-read. Michelle Tillis Lederman is a networking virtuoso whose insights are indispensable for anyone seeking to take their personal and professional life to the next level. 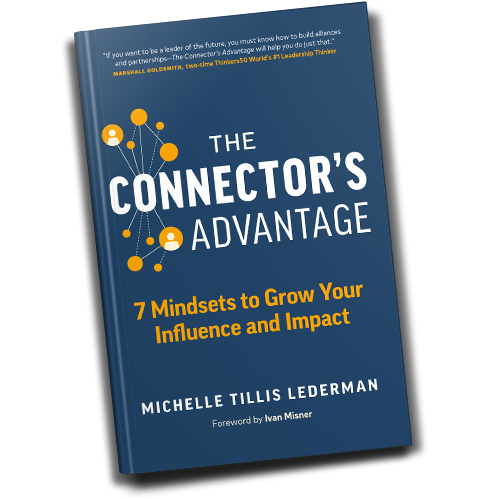 Michelle Tillis Lederman’s book, The Connector’s Advantage, speaks to me in all the ways that shape the heart of my core beliefs about networking and building a connected support network. “Connections matter,” Michelle says, and she couldn’t be more right. Strategically speaking, nothing matters more. This book belongs in your top five business/leadership library. Keep it close – you will be re-reading it often. Any successful business person will tell you that they didn’t get where they are on their own. Michelle Tillis Lederman’s book not only describes how to make successful connections, but also guides you through the steps of how to develop and supercharge the relationships that will take your life and career to the next level. As a champion of promoting diverse and inclusive workforces, and empowering executive-level talent for people of color, my impact often depends on the quality of the relationships I am able to cultivate with others. Michelle Tillis Lederman’s insights into creating, nurturing and sustaining authentic connections are invaluable to my work in this realm. The Connector’s Advantage has earned a coveted place on my bookshelf and will be recommended to the participants of our professional development academies. When a networking guru like Michelle Tillis Lederman shares her knowledge, everyone should pay attention! The tools and insights offered in The Connector’s Advantage are invaluable to anyone seeking create powerful strategic connections in order to broaden their impact and influence. Denise Brosseau, CEO of Thought Leadership Lab and author of Ready to be a Thought Leader? Today, we can connect with people in many ways both digitally and in person, The Connector’s Advantage explores the ways to authentically connect with others to improve our lives professionally and personally. In business, we need to remain connected in order to collaborate to solve the complex problems we encounter and need to solve quickly and innovatively. One of the most powerful things an entrepreneur can do is create a network of authentic connections. The Connector’s Advantage should be in every business-minded individual’s library. Whatever stage your business or career is at, a carefully cultivated network can help move you up to the next level. Michelle Tillis Lederman has a black belt in networking and isn’t afraid to use it! Keeyaaa! In The Connector’s Advantage, she is your Sensei, teaching the moves and skills you need to become a master communicator. Full of ‘judo chop’ insights she has collected from other networking masters, it’s a book no aspiring influencer should be without. None of us goes through life alone, nor should we. Authentic, collaborative relationships are imperative to achieving any type of personal or professional transformation. The Connector’s Advantage is essential reading for anyone desiring a stronger, more powerful launch pad for change. I’ve worked in the White House, Hollywood and Silicon Valley—none of which would have been possible if I hadn’t cultivated strong relationships with the right people. Like me, Michelle Tillis Lederman has walked the walk, and has the credentials to prove it. As one of Forbes Top 25 Networkers, she is a virtuoso in creating connections. The Connector’s Advantage is masterclass in networking, from one of the best. We’ve all heard the saying: it’s not what you know, it’s who you know. It’s also, as Michelle Tillis Lederman understands so well, how well they know you. As an HR executive, I can attest to the fact that the ability to engage and connect with others is a critical element of any successful career. The Connector’s Advantage is overflowing with insights that will benefit individuals at any stage of their career.